Ending the Mesozoic Era and lasting almost 80 million years ago, the Cretaceous Period ran from about 145 million to 66 million years ago. 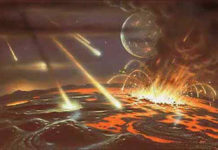 During this period, life on Earth began to recover from the minor extinction event of the previous period. It was also a time when the supercontinent Pangaea continued drifting apart. As the period continued on, the continents began to move closer to their modern positions and Africa had assumed its distinctive shape, as did South America. However, there were also continental differences, too. Australia was still a part of Antarctica and India had not yet collided with Asia. The most interesting changes, however, was evolution and how it altered life during this time period. 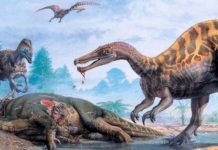 Mammals continued to evolve during this time, but they remained small, which isn’t surprising considering that archosaurian reptiles – especially dinosaurs – were widespread and would have devoured any mammalian creature which couldn’t run and hide. Some common mammals include Deltatheroida, Schowalteria, Stagodontidae, and Zhelestidae. At the beginning of this period, Pterosaurs were prevalent but for some unknown reason began to diminish as the period wore on. Insects began to increase their numbers and diversify as well. These included termites, ants, moth-like insects known as Lepidopterans, gall wasps, and grasshoppers, bees and aphids. Flowering plants also began to adapt and spread during the Cretaceous Period. Thanks to the evolution of bees, a variety of different Angiosperms began to multiple. These include figs, magnolias, leafy trees and monkey puzzle trees. However, not all flora species were successful during this time. Bennettitales and Hirmerellan Conifers would see their number dwindle throughout this period until they eventually went extinct. 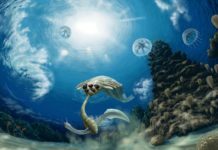 Marine fauna became more diverse during the Cretaceous Period as well. There were a variety of marine reptiles present, which included ichthyosaurs and plesiosaurs and mosasaurs. Modern sharks and rays also became common during this time, as did starfish, sea urchins and other forms of echinoderms. All through the Jurassic, the Earth had begun cooling and this trend continued throughout the first age of this period. Higher latitudes most likely saw snow and the tropics probably saw a large amount of precipitation. 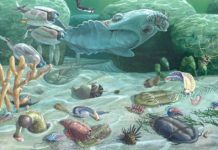 By the end of the Early Cretaceous Epoch, however, global temperatures once again started rising. Life continued to thrive throughout this period – at least, it did until the K-T Extinction Event (now becoming known as the K-PG Extinction Event. A large object collided with the Earth and caused 75% of all of the world’s species to go extinct. Animals such as ammonites, freshwater snails, freshwater mussels and rudists were either pushed to extinction or suffered heavy casualties. However, insectivores, omnivores, and scavengers survived this event. This included mammals and birds. Champsosaurs and crocodiles were able to survive the event because they were semi-aquatic and could live off of food available in rivers and lakes. 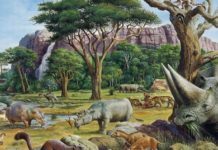 This mass extinction opened up several ecological niches but it took some time for these niches to become filled thanks to the all-out devastation of the event. 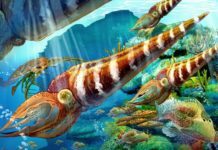 However, life did eventually recover and continue to prosper into the Tertiary Period.